Market Economy Status: Why is China making a big fuss? China regards market economy status (MES) as its automatic right, but has misunderstood the EU’s decision-making process. Beijing should not overreact to the parliament’s rebuttal, argue Xiaoyan Tang and Shaohua Yan. Xiaoyan Tang, East Asia policy independent consultant and Shaohua Yan is a PhD candidate for European Studies at the University of Hong Kong. 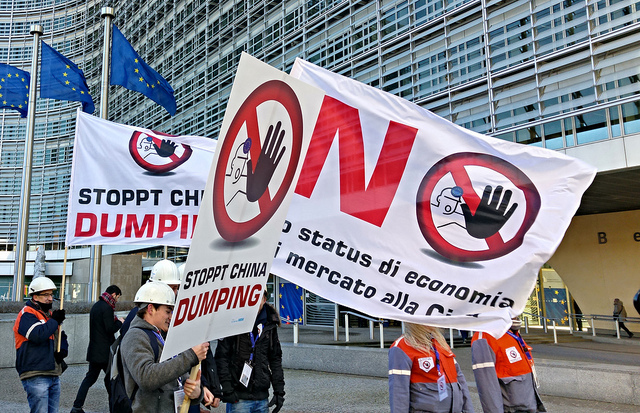 On 10 May 2016, hundreds of German steel workers gathered in front of the European Parliament building in Strasbourg, urging the EU to take action against the dumping of cheap Chinese steel products in the EU. Later the same day, the parliament overwhelmingly adopted a resolution against the unilateral granting of the Market Economy Status (MES) to China. While this may come also as a surprise to the Commission, which was believed to be keeping a low-profile on the issue, China is apparently embarrassed and even offended by the tough position expressed by the European Parliament. The frustration has been particularly visible in the Chinese media, which interpreted this vote as Western prejudice against China and questioned whether it marked the overturning of the ‘friendship boat’ of China-EU relations. China’s interpretation of the result leaves the impression that Beijing is making a fuss about this vote. And this highlights the need for China to get a deeper understanding of some key components of the issue, so as to narrow the perceptual gap. Legally speaking, the dispute regarding the granting of MES derives from China’s interpretation of Article 15 of its WTO Accession Protocol. Article 15 paragraph (d) previewed the expiration of Non-Market Economy treatment towards Chinese products from December 2016. However, despite its intrinsic contradictions and the ambiguity of its terms, the text does not indicate the “automatic granting” of MES to China. On the contrary, to obtain MES, China is required to comply with the domestic laws of WTO member states. China’s interpretation the expiry of Non-Market Economy treatment as leading to the automatic granting of MES has led Beijing to hold a rather inflexible attitude from the beginning. Moreover, it is this very insistence on the “automatic” nature of the process that has left so little space for negotiation and made it easier for the EU to challenge the Chinese position. If MES matters so much to China, it is also because of its significant symbolic importance for the country. Clearly, when China joined the WTO in 2001, there was widespread hope that it would integrate into the international trade system and come to be regarded and treated on an equal footing to the Western economic powers. Owing to the country’s spectacular economic expansion, the recent slowdown notwithstanding, Beijing views the granting of MES as natural reward from the West for its home-grown success, the development of a competitive new economic model. Moreover, in view of the recent economic slowdown which casts a shadow over the country’s future, Beijing is in urgent need of recognition for its achievements, which can justify its structural reforms aiming to cut the problem of overcapacity. This expectation, along with the country’s growing international ambitions, contrasts starkly with the denial from the EU that China is obliged to face. Too late to soften its stance, China has reached a point of no return. The overreaction of Chinese side might also be explained by a misunderstanding of the consensus decision-making process at the EU level. The decision on whether or not to grant China MES will be made through the ordinary legislative procedure (co-decision). While awaiting the Commission’s impact assessment, the European Parliament jumped in with its non-binding resolution for one simple reason: by expressing their concerns at an early stage, MEPs alerted the other institutions to the possibility that they may block the proposal on MES. The pressure is now on the Commission to stress the importance of China’s structural reforms as well as the non-negotiable prerequisites – meeting of all five of the criteria set by the EU for a Market Economy. Considering that the EU is seeking a consensus between its institutions, the resolution is just one step in the whole procedure. Therefore, while bearing in mind that the success of the final proposal is by no means guaranteed, there is no need for China to be so sensitive and to make a big fuss over MES.